A seedling heat mat is a special waterproof mat with heating coils inside the mat. It's plugged into a standard outlet, and as the coils heat up, they produce gentle heat. 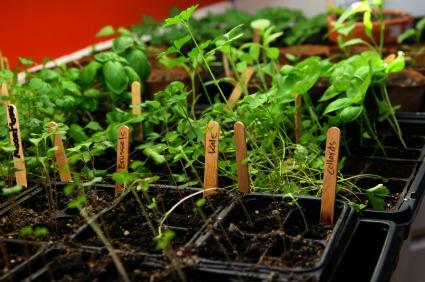 You place the mat under your trays of seeds and seedlings. The warmth encourages faster growth. Before you rush out to buy a seedling heat mat, learn more about how to use it, types available, and safety precautions. Seedling heat mats add extra heat underneath seed starting trays. They encourage rapid, strong growth among certain seedlings, especially those that require warmer temperatures to germinate. While you don't necessarily need a heat mat to start seedlings, they do increase the germination rate among most seedlings and some seeds require the burst of heat in order to germinate. Nearly all seed starting heat mats look like heating pads you use when you hurt your back. It's a mat, covered with a heavy waterproof plastic. Inside the mat are small electrical coils. There's a cord and a plug coming out of the mat. You plug the mat into a heat control thermostat box (either purchased with the mat or separately), which then plugs into a standard wall outlet or into a power strip where you can plug multiple heat mats. Gardening mats should always be waterproof. Check the box when you buy it to make sure it is waterproof since electricity and water should never mix. If you find older ones at a flea market, yard sale or on the secondhand market, examine them carefully for cracks and rips. Don't use them if they show significant signs of wear and tear. Mats are sold in a variety of sizes. They're sized to standard seed starting trays, so you'll find them sold in smaller sizes capable of heating one standard 1020 nursery flat all the way up to four flats. Use the size best for the trays you have. A larger mat isn't necessarily better if you don't have trays to sit upon it. In fact, you'll be wasting heat and electricity if you buy too large a mat. A thermostat controller isn't necessary, but most gardeners swear by them. It's an extra box multiple mats can plug into. You set the temperature using a gauge. A typical heating mat without a controller box raises the temperature about 10 degrees, but sometimes up to 20 degrees. It's difficult to regulate or control. With a thermostat, you can set the temperature to whatever you want. The controller keeps the temperature underneath the seed starting trays nice and even to whatever number you set it for. Follow the safety directions with your thermostat controller unit, especially any notations about how many seedling mats can be plugged into one unit. Don't try to force more into the unit or jerry-rig it to handle more; this can start a fire. If mats are too expensive or not to your liking, there are two other options for adding heat to your seed starting trays. You can build a small box that surrounds the seed starting tray, adding a simple incandescent light bulb to the box. Use a thermometer to measure the temperature inside, and add a timer to the light. This light should be used in addition to whatever light source you have on the tray for regular growth. The light bulb adds heat and the box creates a small micro climate for the tray. Another option are heating coils or cables. These are metal coils you bury inside the seed tray. They're meant to be buried in sand or gravel only; you can bury them inside a gravel tray, then put the soil tray on top. Never use heating pads or electric blankets meant for general home use. Although both produce heat, neither are waterproof, and you could start a fire or create a potentially dangerous situation if water gets onto them. In addition to the fire and electricity hazard with such objects, they can also cook your seedlings, growing way too hot for the task at hand. Invest in seedling mats specifically meant for gardening use. They're built with the many safety features needed by gardeners for safe use in the home.